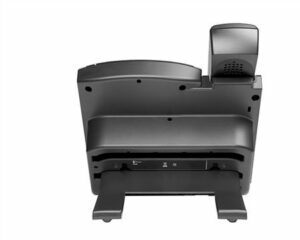 From time to time you might need to adjust the angle of your Polycom Cloud Phone. For instance, if your desk is close to a window you might want to change the angle of the phone to eliminate glare on the screen. If your desk is quite low, you might want the stand on the lowest height. This way, you don’t need to reach up to high when you answer the phone. If you suffer with back and neck problems you need to adjust office and phone equipment to suit their posture. There are many different reasons for having your phone at different heights whilst you work. With just a few simple steps you can make this change no problem. Step one – If you turn your Polycom phone over you will see the phone stand positioned in the back of your phone. 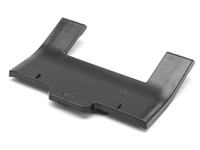 The phone stand is a black piece of plastic as shown in the image below. Step two – Gently pull on one corner of the stand it should easily release it from its position. You will see there are three height positions running across the phone. Gently push the stand into each one of the height positions, making sure to turn the phone over each time. Now place it in the correct position on your desk so that you can try the phone height out. Step three – Once you have the required height for the stand, make sure the stand is slotted firmly into your chosen height position. Now you can turn your phone over and place it back on your desk. We hope the above information was useful for you. If you would like help or advice on using your Cloud phone then please, call us on 0800 505 3350. You can also drop us a contact form and we will be happy to discuss this with you. Alternative why not visit our Cloud telephone systems page where you can find out more about this great technology and see how it could improve your business.